Once a year, Cadbury makes one of my favorite candies: Cadbury Mini-Eggs. Unfortunately for me, I seem to have no self control with these candies--I will eat them until my tummy aches and it pleads no more! And I'll oblige that tummy, oh, I'll treat it nice....but the minute that it's no longer aching, I'm right back at it eating more Cadbury Mini-Eggs. Then, I got the bright idea that if I were to wrap these precious-once-a-year-only candies in something--say a cookie (I thought about decorating cupcakes with it but knew I'd just pluck the candies off)--then it would slow down my consumption of Cadbury Mini-Eggs. Or at the least it would take my stash out of hiding and put them in a form readily available to the rest of the family. 1. Preheat the oven to 375. In a mixing bowl, cream together the butter and the sugars. Beat in the egg until well combined. Add the vanilla, baking powder and salt and mix well. Slowly stir in the flour and the Cadbury Mini-Eggs. 2. Form the dough into balls about the size of a ping pong ball and place on baking sheet that has been covered with parchment paper. You can place them directly on the sheet if you prefer. Bake at 375 for 8-10 minutes being very careful not to overbake. 3. Slide the parchment paper of the baking sheet directly onto a wire rack. 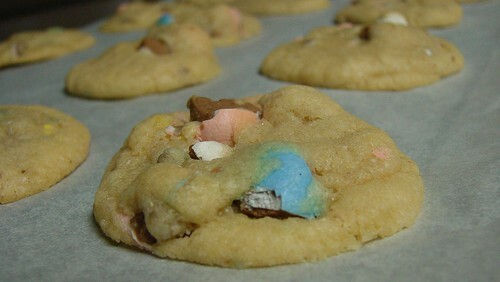 Or if you didn't use the parchment paper, allow the cookies to cool for an additional minute or two on the baking sheet to prevent the soft cookies from slipping through the bars of the wire rack. Cool completely. Makes about 2 dozen. I'm really sorry if anyone doesn't have these candies available at their local stores!